Fletcher Norton (1716-89), a lawyer and politician, was the eldest son of Thomas Norton, of Grantley, Ripon. He served as MP for Appleby in 1756-61, Wigan in 1761-68, and Guildford in 1768-82. In addition Norton was Solicitor General in 1762-63, Attorney General in 1763-65, he was Knighted in 1762, he was Speaker of the House of Commons in 1770-80, and was created Baron Grantley of Markenfield in 1782. In 1741 Norton married Grace Chapple, the daughter of Sir William Chapple Kt, Justice of the King's Bench. It was by this marriage that Norton came into the possession of Wonersh Park. Wonersh Park had a seventeenth-century house which was to receive eighteenth-century alterations. 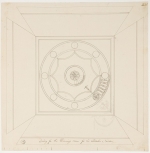 In 1767 Adam was employed to make designs for the interior decoration of the house, as well as for a stable and farm court, but these design were not executed. Prior to his time in the House of Commons, Norton had conducted legal business with the Lowther family. He remained in contact with Sir James Lowther throughout his career, and through Sir James, Norton became acquainted with Lords Bute and Mansfield. All three of these men were patrons of Robert Adam, at Lowther Hall, Luton Park, and Kenwood respectively, and it may have been through these connections that Adam came to Norton’s attention. The house at Wonersh was demolished in 1935. According to Pevsner a 'ham-fisted' eighteenth-century Gothic entrance gateway survives, as well as an eighteenth-century stable court, which has been converted into Wonersh Court. There are three drawings for Adam’s unexecuted design for a stable and farm court in the Cumbria Record Office.